Supramolecular hydrogelators based on ureido-pyrimidinones allow full control over the macroscopic gel properties and the sol–gel switching behavior using pH. Here, we present a protocol for formulating and injecting such a supramolecular hydrogelator via a catheter delivery system for local delivery directly in relevant areas in the pig heart. Pape, A. C., Bakker, M. H., Tseng, C. C., Bastings, M. M., Koudstaal, S., Agostoni, P., Chamuleau, S. A., Dankers, P. Y. An Injectable and Drug-loaded Supramolecular Hydrogel for Local Catheter Injection into the Pig Heart. J. Vis. Exp. (100), e52450, doi:10.3791/52450 (2015). Regeneration of lost myocardium is an important goal for future therapies because of the increasing occurrence of chronic ischemic heart failure and the limited access to donor hearts. An example of a treatment to recover the function of the heart consists of the local delivery of drugs and bioactives from a hydrogel. In this paper a method is introduced to formulate and inject a drug-loaded hydrogel non-invasively and side-specific into the pig heart using a long, flexible catheter. The use of 3-D electromechanical mapping and injection via a catheter allows side-specific treatment of the myocardium. To provide a hydrogel compatible with this catheter, a supramolecular hydrogel is used because of the convenient switching from a gel to a solution state using environmental triggers. At basic pH this ureido-pyrimidinone modified poly(ethylene glycol) acts as a Newtonian fluid which can be easily injected, but at physiological pH the solution rapidly switches into a gel. These mild switching conditions allow for the incorporation of bioactive drugs and bioactive species, such as growth factors and exosomes as we present here in both in vitro and in vivo experiments. The in vitro experiments give an on forehand indication of the gel stability and drug release, which allows for tuning of the gel and release properties before the subsequent application in vivo. This combination allows for the optimal tuning of the gel to the used bioactive compounds and species, and the injection system. Although the treatment of acute myocardial infarction has significantly improved survival rates, the chronic ischemic heart failure is a major public health problem that progresses with an aging population. There are approximately 6 million heart failure patients in the US with an estimated 25% increase in prevalence in 20301,2. Initial loss of myocardial tissue leads to cardiac remodeling and eventually causes chronic heart failure. Except for heart transplantation, there is no real treatment for this group of patients. The increasing shortcoming of donor hearts emphasizes the need to develop new available therapies to reverse this process of remodeling. Therefore, a goal for future therapies is the regeneration of lost myocardium. Hydrogels are interesting materials in the field of regenerative medicine because of their biocompatibility, and their sensitivity to external triggers3. Injectable hydrogels offer advantages over non-injectable hydrogels in their use in minimal invasive surgery4. These injectable hydrogels can be applied through a syringe because of their switchability within physiological conditions5, and in principle allow for catheter-based injection approaches6. Different strategies have been used for injectable materials, ranging from chemical crosslinking after injection to physical crosslinking by either temperature, pH and shear-thinning behaviour4,7,8. Although several systems have shown easy injectability via a syringe9,10, full catheter-compatibility has not been shown often6. Hydrogels prepared from supramolecular polymers are formed by non-covalent interactions which can be switched conveniently from a gel to a solution state, and vice versa using environmental triggers11. Furthermore, the low molecular weight precursors allow for easy processability12,13. The mild conditions required for switching allow the addition of various biological active components such as often difficult to handle growth factors. Supramolecular transient networks in water based on poly(ethylene glycol) (PEG), end-modified with ureido-pyrimidinone (UPy) moieties14 have shown the benefits of non-covalent interactions in combination with biomedical applications and have been used as drug delivery system in the heart6 and under the renal capsule15. These networks are formed by dimerization of the UPy-groups shielded from the aqueous environment by alkyl spacers forming a hydrophobic pocket. Urea hydrogen bonding facilitates subsequent stacking of these dimers into nanofibers. Due to the reversible interaction of the UPy-UPy dimer, triggers such as pH and temperature can be used to switch from solutions to gels. The use of a synthetic motif allows for design of the molecule and gel properties by for example tuning length of the PEG-chains and alkyl spacers14,16. Moreover, several bioactive components can be incorporated by simply mixing the supramolecular hydrogelator solution before injection, with drugs or bioactive species, such as growth factors or exosomes, respectively. Exosomes are small membrane vesicles that contain cytosolic derivatives. They are secreted by many cells and are involved in intercellular communication. Exosomes derived from cardiomyocyte progenitor cells are suggested to play a role in cardiac protection17. Here, we describe the protocol of formulation, and in vivo myocardial injection of such a bioactive supramolecular hydrogel. In vitro experiments are described which give on forehand an indication of gel stability and drug release, which allows for tuning of the gel and release properties before application in vivo. NOTE: All in vivo experiments were conducted in accordance with the Guide for the Care and Use of Laboratory Animals by the Institute of Laboratory Animal Resources. Experiments were approved by the Animal Experimentation Committee of the Medicine Faculty of the Utrecht University, the Netherlands. To prepare 1 ml of the 10 wt% gel, dissolve 100 mg of the UPy-hydrogelator in a vial in 900 μl PBS pH 11.7 by stirring at 70 °C for 1 hr using a magnetic stirrer. Afterwards cool the viscous solution down to room temperature. The solution should now have a pH of approximately 9.0. This solution can be stored for several days. Pipette the appropriate amount of drug or biomolecule that is dissolved in neutral PBS into the viscous solution and stir for 10 min to reach a uniform distribution. If the solution becomes too viscous, shortly warm it with hot water. Place the solution for 1 hr under an UV-lamp to sterilize. Before loading the gel, mount the 25 mm plate-plate geometry in the rheometer, set the temperature to 20 °C and load the plate with water to prevent evaporation of the gel during measurement. Pipette 300 μl of the solution onto a 25 mm plate-plate geometry on a rheometer maintained at 20 °C and lower the plates to obtain a 0.5 mm gap distance. Record shear viscosity as function of shear stress from 0.1 to 500 Pa with 10 points per decade. Pipette 300 μl of the solution onto the plate and pipette a total of 4.2 μl of 1 M HCl at different places on the solution to induce the gel formation. Lower the plates to a gap distance of 0.5 mm and let the gel cure for approximately 30 min. During this curing process, measure the storage and loss moduli at low frequency and strain, for example respectively 1 rad/sec and 0.5%. After the gel has cured (after approximately 30 min), record storage and loss moduli as function of the frequency (0.1-100 rad/sec) and subsequently as function of the strain (0.1-1,000%). Transfer 100 µl of the viscous solution containing the drug or biomolecule into a poly(ethylene terephthalate) hanging cell culture insert for 24-wells plate with pore size 8.0 µm. To prevent leakage of the polymer solution while in the liquid phase, cover the bottom of the inserts with Parafilm (Figure 2A). Immediately afterwards pipette 1.4 µl of 1 M HCl on top of the viscous solution to reduce the pH to approximately 7.0-7.2 and let the gel cure inside the insert for about 30 min. Remove the Parafilm from the inserts, place the insert in a 24-well plate and fill the well with 800 µl PBS pH 7.4. Incubate the plate at 37 °C with slow rocking or shaking movement. To prevent evaporation of the solvent, fill remaining empty wells with PBS and seal the 24-well plate with Parafilm (Figure 2B). Periodically refresh the PBS and analyze the removed PBS for released UPy erosion product or drug/biomolecule. Quantify UPy erosion products or pirfenidone by measuring UV absorbance at 265 nm or 320 nm respectively. For fluorescent protein mRuby2 measure fluorescence emission at 587 nm after excitation at 559 nm. Translate measured absorption/emission values to concentrations via predetermined calibration curves. Prepare calibration curves dissolving a series of known concentrations of the analyte in buffer and measure the UV absorbance or fluorescent emission of these samples. Interpolate the data using a linear function to determine the concentration of the unknown samples. For non-fluorescent proteins use ELISA detection6. After 12 hr of fasting, excluding water, sedate the pig in its stable by injecting midazolam 0.4 mg/kg, ketamine 10 mg/kg and atropine 0.014 mg/kg intramuscularly. Administrate sodium thiopental 5 mg/kg intravenously to induce anesthesia and intubate the pig with an endotracheal tube. Perform balloon-ventilation at a rate of 12/min if needed while transporting the animal to the operating theater. On arrival at the operation theater immediately start mechanical positive pressure ventilation with FiO2 0.50, 10 ml/kg tidal volume, and a frequency of 12/min under continuous capnography. Use vet ointment on the eyes to prevent dryness. Start balanced anesthesia by continuous intravenous infusion of midazolam 0.5 mg/kg/hr, sufentanil 2.5 µg/kg/hr and pancuronium bromide 0.1 mg/kg/hr. To ensure proper anesthesia continuously monitor ECG, arterial blood pressure, temperature and capnography. Intravenously infuse 4.3 mg/kg amiodarone and place the intracardiac defibrillation catheter in the right ventricle using the venous sheeth18. Occlude the left anterior descending artery (LAD) distal to the second diagonal branch by intracoronary balloon occlusion, for 90 min, in accordance to previously described protocol18. At four weeks after myocardial infarction, plan the mapping procedure. 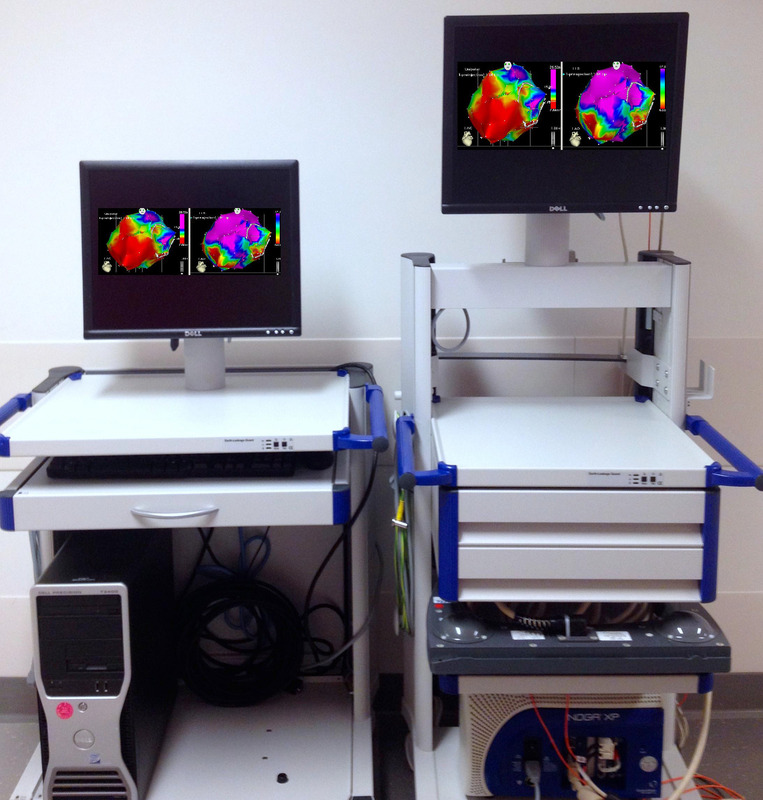 Prepare the system (Figure 4) in the cathlab for 3D electromechanical mapping (EMM) of the left ventricle. With this system viable, hibernating and infarcted myocardium can be identified without fluoroscopic guidance. To construct such an EM-map acquire a series of points at multiple locations on the LV endocardial surface by using an ultralow magnetic-field energy source and a sensor-tipped catheter19,20. Anesthetize the pig, following protocol steps 4.1.1-4.1.4. Place the external reference patch on the pig’s back. Secure vascular access (femoral artery) according to protocol18. After obtaining a biplane left ventricular angiogram in the 25° right anterior oblique (RAO) and 40° left anterior oblique (LA) view to estimate left ventricular size, give 75 U/kg of heparin. Advance an 8 French-mapping (D or F curve) catheter under fluoroscopic guidance to the descending aorta, aortic arch and across the aortic valve into the left ventricle (LV). Orientate the tip of the catheter to the apex of the LV to acquire the first data, followed by outflow tract, lateral and posterior points to form a 3D silhouette, defining the borders of the ventricle. Obtain subsequent points until all endocardial segments have been sampled by dragging the mapping catheter over the endocardium and sequentially acquiring the location of the tip while in contact with the endocardium21,22. Define the target area, that is where electrical activity is (near) normal and mechanical movement impaired, so-called hibernating myocardium (Figure 6). Replace the mapping catheter by the intramyocardial injection catheter which is composed of a 27-gauge needle and a core lumen inside an 8 French catheter (Figure 5A and B). To deliver specific amounts, load a volume-graded syringe with approximately 2 ml of the hydrogel solution and place it into a syringe pump. Adjust the needle extension at 0° and 90° flex and place 0.1 ml of the hydrogel solution to fill the needle dead space. Then, place the injection catheter tip across the aortic valve and into the target area. Meet the following criteria for an injection position inside the target area determined in 4.2.9: (1) perpendicular position of the catheter to the LV wall; (2) excellent loop stability (<4 mm) as calculated by the EMM-system; and (3) underlying voltage >6.9 mV21. Advance the needle into the myocardium, (4) confirmed by a premature ventricular contraction of the LV, and inject 0.1-0.3 ml of the hydrogel in a bolus at a constant rate of approximately 0.4-0.5 ml/min using the syringe pump. Repeat this at 6-10 different positions as diffuse as possible. The natural pH of the tissue will neutralize the solution after injection, upon which the hydrogel is formed. Post-procedure, humanely sacrifice the animal by exsanguination. Cut the inferior caval vein and remove blood with a suction device. Induce ventricular fibrillation by placing a 9 V battery on the apex. Typical results obtained from the oscillatory rheological measurements on both the solution and the gel are shown in Figure 1. For injection through a long catheter, a Newtonian fluid with low viscosity is desirable. Viscosity was measured as function of shear rate, showing that at pH 8.5 the solution is shear thinning but at pH 9.0 and 9.5 the solutions behave as Newtonian fluids as evidenced by the constant viscosity of 0.54 and 0.36 Pa·sec, respectively (Figure 1A). After neutralizing the samples, the samples show a solid-like response observed by a storage modulus G′ which is larger than the loss modulus G″ and therefore a tanδ = G″/G′ <1 (Figure 1B). The gel obtains its final strength within 30 minutes. Oscillatory rheological measurements show a typical solid-like response with G′ almost independent of the angular frequency and G′ >G″ for all frequencies measured (Figure 1C). Essential for the use as drug delivery system is the erosion of the hydrogel over time. The supramolecular interactions are inherently dynamic and allow for a slow erosion of the gel in vitro. Erosion and release experiments are performed at 37 °C using porous well inserts (Figure 2A and B). By tuning the length of the hydrophobic and hydrophilic block14, a gel that erodes over a period of several weeks can be obtained (Figure 3A). The gel erodes 25% in 2 weeks with an initial erosion of 10% in the first day, presumably due to initial swelling of the hydrogel. As example, both the release of a small molecule drug (pirfenidone), and the release of a model fluorescent protein (mRuby2) was studied. A fluorescent model protein allows for an easy readout; however, in vitro release experiments can also be performed on other proteins using ELISA for quantification6. The small molecule drug is released within a day, while bigger molecules such as proteins are gradually released over 1 week (Figure 3B). Fitting the release profile of mRuby2 up to 60% release with the semi-empirical Korsmeyer-Peppas model indicates release due to diffusion (n = 0.44)23. The absence of an offset in the (adapted) Korsmeyer-Peppas model shows that there is no burst release present for mRuby224. Because of the limited amount of data points with a release lower than 60% for pirfenidone, no fitting was performed on this release profile. The catheter navigation system consists of a communication unit console, a workstation (Figure 4), a triangular location pad (generating a low magnetic field) with an external reference patch, and two catheters, the sensor-tipped mapping and the injection catheter (Figure 5). 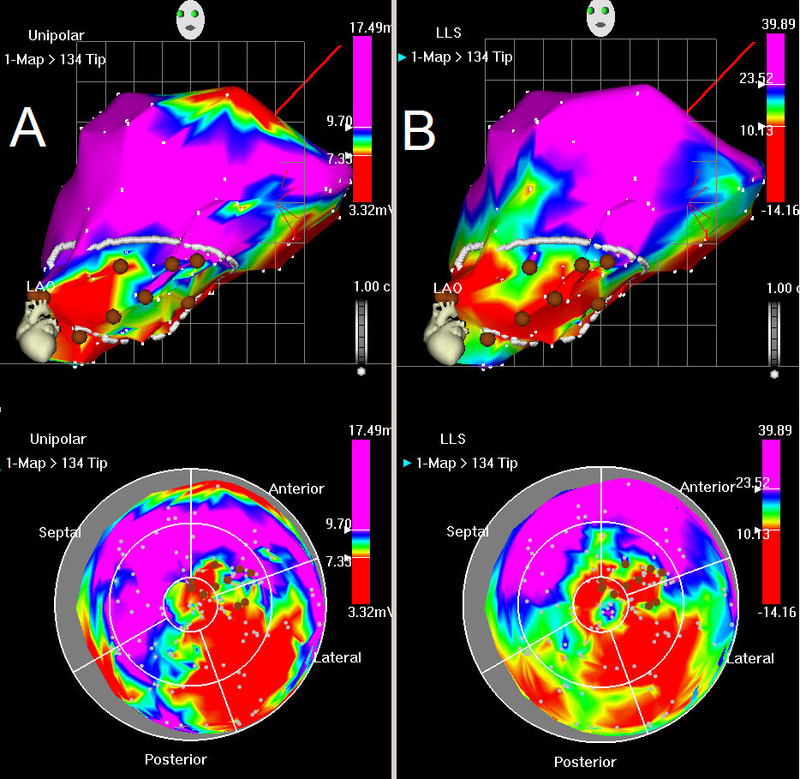 After post-processing analysis has filtered unstable points the 3D endocardial reconstruction of the LV is updated in real time with the acquisition of each new data point and is continuously displayed as unipolar and bipolar voltage potentials on a graded color scale (Figure 6A). The local linear shortening (LLS) function quantifies regional wall motion by obtaining the average change in distance between sample site and adjacent points at end-systole and end-diastole. The mean voltage and LLS values are calculated for each segment and displayed in the polar map. (Figure 6B). The presence of an abnormal or low unipolar potential (≤6 mV) and impaired mechanical activity (LLS ≤4%) characterizes infarcted areas22. Figure 1:. Rheological assessment of the solutions and gels. (A) Viscosity as a function of shear rate for the solutions at different pH. For the sample at pH 8.5 shear thinning is observed but for the samples at pH 9.0 and 9.5 constant viscosities are obtained, showing the Newtonian behavior of these solutions. (B) Gel curing followed by plotting tan δ as a function of time. (C) Frequency sweep for a neutralized sample after 2 hr curing. Error bars show standard deviations of 3 independent measurements, indicating a typical experimental error. Figure 2: Setup for degradation and release experiments. (A) Poly(ethylene terephthalate) well insert covered with Parafilm to prevent leakage during preparation. (B) 24-wells plate with inserts, wrapped with Parafilm to prevent evaporation of the solvent. Figure 3: Erosion and Release. (A) Erosion of the hydrogel over time. Gradual erosion of the gel for at least 2 weeks is observed. (B) Release of a small molecule drug and a model protein. While the small molecule is released within a day, the model protein is gradually released over a week without a significant burst release. The line shows the fit of the Korsmeyer-Peppas model to the initial stage of the release. Figure 4: The catheter navigation system. Communication unit console with NOGA XP Cardiac Navigation System. Figure 5: (A) The intramyocardial injection catheter with syringe attached. (B) Detail of injection needle. Figure 6: Unipolar voltage and LLS map. (A) Unipolar map, LAO view (top) and bulls eye (below). Red color indicates low unipolar voltage values at myocardial base (normal) with loss of electrical activity posterolateral. Blue indicates normal myocardium, whilst green and yellow colors indicate decreased viability. (B) LLS map, LAO view (top) and bulls eye (below). Red color indicates akinesia in the posterolateral wall, green and yellow indicate decreased wall motion. The mapping points are shown by white dots. The drawn white line shows the area of interest, characterized by decreased unipolar voltages and impaired wall motions. Brown points represent the injection sites. A key challenge is to obtain a solution which is injectable through a long catheter while keeping the solution compatible with the bioactive compounds. Although the pH should be increased to increase injectability, bioactive compounds such as growth factors are fragile molecules that should be handled carefully. We monitor the pH of the solution closely using a pH meter after adding the hydrogelator to confirm it is pH 9.0 before adding any bioactive components. Initially, several rounds of adjusting the starting pH of the PBS were necessary to end with the right pH. Furthermore, because we use relatively viscous solutions and a long thin catheter, a large pressure drop is present (in the order of 0.5 MPa, depending on the speed of injection). Therefore, special care should be taken in selecting the right connections between the syringe and the catheter. A syringe pump supports controlled injection, as applying such forces by hand is challenging. For in vitro experiments, the solution was gelated by neutralizing the solution with HCl, while in vivo this is done by the natural pH of the tissue. Therefore, it is important to add the right amount of HCl to prevent an overshoot in pH. The diffusion of this acid is probably the limiting factor in the gelation of the hydrogel in in vitro experiments; however, in vivo the liquid would have a high contact surface area with neutralizing tissue, which will most likely result in a faster and more evenly gelation compared to dropwise addition of concentrated acid. Moreover, the gel switching is much faster with this mild procedure as compared to previously used methods (0.5 hr vs 2 hr)25. Using the body’s natural pH for switching of the material properties is very appealing since the transition is swift, reversible, cannot occur inside the catheter and is in vivo fully automatic. These properties give advantages over e.g. thermal switchable gels26, where risk of gelation in a catheter due to temperature changes is present, gels that require photo-induced polymerization, which is challenging due to limited light penetration and radical formation27, or gels that require co-injection of a polymerization initiator or accellerator28. Successful release of a drug from the hydrogel largely depends on the size of the drug. As shown, the small molecule drug is released immediately while the gradual release of the model protein over 1 week shows the promise of these hydrogels as delivery systems for growth factors. In general, hydrogels are more promising as delivery tool for larger objects such as proteins, exosomes and cells29,30. The 3-D electromechanical mapping and injection procedure provides a clinically validated catheter-based delivery approach for various myocardial regenerative therapies, such as hydrogels. The added value of this technology compared to other non-surgical delivery techniques is the treatment planning, making it possible to differentiate normal, infarcted and hibernating myocardium and to guide therapies in the area of interest. Drawbacks of this approach concern the required technical skills and the time consuming and expensive procedure20. In the presented porcine model of myocardial infarction electromechanical mapping was followed by guided intramyocardial injections with the bioactive supramolecular UPy-hydrogel. Other combinations with regenerative therapies have to be tested in vitro and in vivo to gain more success in this emerging field. Furthermore, optimization of injectability and sterilization procedures have to be performed to successfully translate this method to a clinical setting. This work was funded by the Ministry of Education, Culture and Science (Gravity program 024.001.035), the Netherlands Organisation for Scientific Research (NWO), the European Research Council (FP7/2007-2013) ERC Grant Agreement 308045 and conducted within the LSH TKI framework. This research forms part of the Project P1.03 PENT of the research program of the BioMedical Materials institute, co-funded by the Dutch Ministry of Economic Affairs. This project was supported by ICIN - Netherlands Heart Institute (www.icin.nl) and the “Wijnand M. Pom Stichting”. The authors would like to thank Henk Janssen and Joris Peters for the synthesis of the UPy-hydrogelator and Remco Arts for providing the mRuby2. We thank Bert Meijer, Tonny Bosman, Roxanne Kieltyka, Stijn Kramer, Joost Sluijter, Imo Hoefer, and Frebus van Slochteren for the many useful discussions and Marlijn Jansen, Joyce Visser, Grace Croft and Martijn van Nieuwburg for technical assistance. Levy, D., et al. Long-Term Trends in the Incidence of and Survival with Heart Failure. The New England Journal of Medicine. 347, (18), 1397-1402 (2002). Roger, V. L., et al. Heart disease and stroke statistics—2012 update: a report from the American Heart Association. Circulation. 120, (1), 2-220 (2012). Peppas, N. A., Huang, Y., Torres-Lugo, M., Ward, J. H., Zhang, J. Physicochemical foundations and structural design of hydrogels in medicine and biology. Annual Review of Biomedical Engineering. 2, (1), 9-29 (2000). Olsen, B. D., Kornfield, J. A., Tirrell, D. A. Yielding Behavior in Injectable Hydrogels from Telechelic Proteins. Macromolecules. 43, (21), 9094-9099 (2010). Guvendiren, M., Lu, H. D., Burdick, J. A. Shear-thinning hydrogels for biomedical applications. Soft Matter. 8, (2), 260 (2012). Bastings, M., et al. A Fast pH-Switchable and Self-Healing Supramolecular Hydrogel Carrier for Guided, Local Catheter Injection in the Infarcted Myocardium. Advanced Healthcare Materials. 3, (1), 70-78 (2014). Pawar, G. M., et al. Injectable Hydrogels from Segmented PEG-Bisurea Copolymers. Biomacromolecules. 13, (12), 3966-3976 (2012). Yoon, H. -J., Jang, W. -D. Polymeric supramolecular systems for drug delivery. Journal of Materials Chemistry. 20, (2), 211-222 (2009). Christman, K. L., Lee, R. J. Biomaterials for the treatment of myocardial infarction. Journal of the American College of Cardiology. 48, (5), 907-913 (2006). Yu, L., Ding, J. Injectable hydrogels as unique biomedical materials. Chemical Society Reviews. 37, (8), 1473-1481 (2008). Krieg, E., Rybtchinski, B. Noncovalent Water-Based Materials: Robust yet Adaptive. Chemistry – A European Journal. 17, (33), 9016-9026 (2011). Davis, M. E., et al. Injectable self-assembling peptide nanofibers create intramyocardial microenvironments for endothelial cells. Circulation. 111, (4), 442-450 (2005). Li, J., Ni, X., Leong, K. W. Injectable drug-delivery systems based on supramolecular hydrogels formed by poly(ethylene oxide)s and alpha-cyclodextrin. Journal of Biomedical Materials Research. Part A. 65, (2), 196-202 (2003). Dankers, P. Y. W., et al. Hierarchical formation of supramolecular transient networks in water: a modular injectable delivery system. Advanced materials. 24, (20), 2703-2709 (2012). Dankers, P. Y. W., et al. Development and in-vivo characterization of supramolecular hydrogels for intrarenal drug delivery. Biomaterials. 33, (20), 5144-5155 (2012). Kieltyka, R. E., et al. Mesoscale modulation of supramolecular ureidopyrimidinone-based poly(ethylene glycol) transient networks in water. Journal of the American Chemical Society. 135, (30), 11159-11164 (2013). Vrijsen, K. R., et al. Cardiomyocyte progenitor cell-derived exosomes stimulate migration of endothelial cells. Journal of Cellular and Molecular Medicine. 14, (5), 1064-1070 (2010). Koudstaal, S., et al. Myocardial infarction and functional outcome assessment in pigs. Journal of Visualized Experiments. (86), (2014). Koudstaal, S., et al. Sustained delivery of insulin-like growth factor-1/hepatocyte growth factor stimulates endogenous cardiac repair in the chronic infarcted pig heart. Journal of Cardiovascular Translational Research. 7, (2), 232-241 (2014). Spoel, T. I., et al. Non-surgical stem cell delivery strategies and in vivo cell tracking to injured myocardium. International Journal of Cardiovascular Imaging. 27, (3), 367-383 (2011). Gepstein, L., Hayam, G., Shpun, S., Ben-Haim, S. A. Hemodynamic evaluation of the heart with a nonfluoroscopic electromechanical mapping technique. Circulation. 96, (10), 3672-3680 (1997). Gyöngyösi, M., Dib, N. Diagnostic and prognostic value of 3D NOGA mapping in ischemic heart disease. Nature Reviews Cardiology. 8, (7), 393-404 (2011). Siepmann, J., Siepmann, F. Modeling of diffusion controlled drug delivery. Journal of Controlled Release Official Journal of the Controlled Release Society. 161, (2), 351-362 (2012). Kim, H., Fassihi, R. Application of binary polymer system in drug release rate modulation. 2. Influence of formulation variables and hydrodynamic conditions on release kinetics. Journal of Pharmaceutical Sciences. 86, (3), 323-328 (1997). Pape, A. C. H., et al. Mesoscale characterization of supramolecular transient networks using SAXS and rheology. International Journal Of Molecular Sciences. 15, (1), 1096-1111 (2014). Lee, B. H., Vernon, B. In Situ-Gelling, Erodible N-Isopropylacrylamide Copolymers. Macromolecular Bioscience. 5, (7), 629-635 (2005). Annabi, N., et al. 25th Anniversary Article: Rational Design and Applications of Hydrogels in Regenerative Medicine. Advanced Materials. 26, (1), 85-124 (2014). Asai, D., et al. Protein polymer hydrogels by in situ, rapid and reversible self-gelation. Biomaterials. 33, (21), 5451-5458 (2012). Peppas, N. A., Hilt, J. Z., Khademhosseini, A., Langer, R. Hydrogels in Biology and Medicine: From Molecular Principles to Bionanotechnology. Advanced Materials. 18, (11), (2006). Lutolf, M. P., Hubbell, J. A. Synthetic biomaterials as instructive extracellular microenvironments for morphogenesis in tissue engineering. Nature Biotechnology. 23, (1), 47-55 (2005).